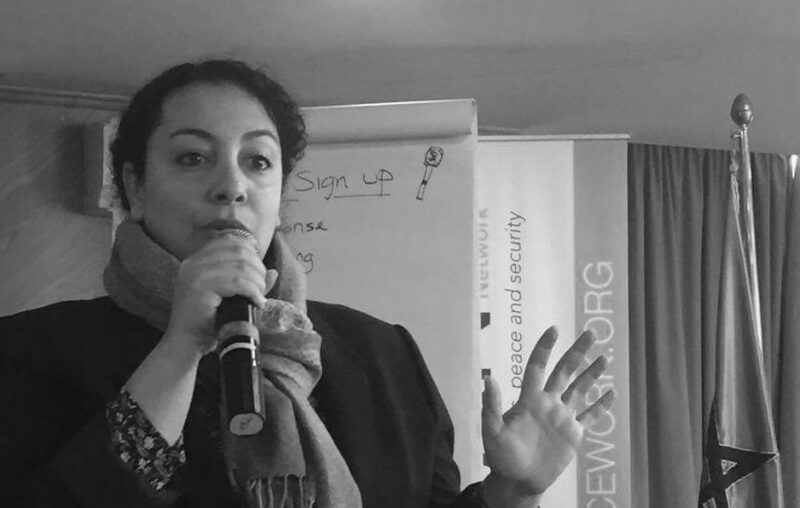 The following is a conversation with Rasha Jarum, founder and director of Peace Track Initiative, on the efforts to secure more meaningful involvement and representation for women in the process to restore peace in Yemen. Ms. Jarum is from South Yemen and has more than 16 years’ experience working on human rights and gender issues. Sonal Marwah spoke with her in August. SM: The situation in Yemen for women has always been bad. Since the civil war broke out, have women’s roles changed? RJ: Yemen is last every year among the countries ranked in the annual Global Gender Gap Index produced by the World Economic Forum. Before the Arab Spring uprising [2011-2012], Yemeni women’s status and rights were terrible. Embedded in our society are discriminatory laws and guardianship rules. Generations of Yemeni women have lived with gender discrimination. When we had the uprising, women claimed our rights and space. Then the war broke out . Since the war began, within the domestic household, the change that has happened and which has also occurred in Syria is not something that I would define as gender role ‘reversal’. Women are bearing the burden of finding livelihoods because the men are injured, detained, or have been killed. Even if this is not generally accepted by society, women are doing it. Some women are doing construction work, which was a field in Yemen that was limited to men. Women doing hard manual labour is not something that Yemeni communities are quite ready to see, but women are doing it. Since the war broke out, many women have to walk for three or four hours to buy the basic necessities such as food and medicines, over difficult terrain, and, at times, in life-threatening situations. Women must go through multiple checkpoints, bearing constant harassment. If the men go, they will be detained at the checkpoints. The women as such would rather risk getting harassed than having their men or relatives detained and forcefully disappear. Amid this misery, women have not stopped their efforts to broker peace, especially at the community level, such as negotiating humanitarian access. Yemeni women play multiple roles in society, yet their efforts go unnoticed. Within the peace track negotiations, I am lobbying for greater involvement of women. For me, some of the roles adopted by women since the war are positive. The conflict is creating opportunities to change the stereotypes of Yemeni women. SM: Yemen’s war has escalated despite efforts by the United Nations to end it. Why do you think that the peace process is stalled? RJ: The National Dialogue Conference process was seen nationally and internationally as a model process. Regardless of any shortfalls in the National Dialogue, it led to important outcomes, outcomes that are historic in terms of respect for human rights, including women’s rights. There was huge interest from the international community to support the National Dialogue, but not enough interest in supporting its actual implementation. For example, there was a need to start a process of reconciliation, reparation for victims, including addressing issues related to compensation of forced retirees, as well as addressing the mass land and property claims in South Yemen. Those tracks were not supported—not technically and not financially. Yemen was already one of the most heavily armed countries in the world per capita; the cities are designed to host military depots and camps, making civilians and residents active human shields. There were not enough efforts to support the process of disarmament and demilitarization. SM: In 2015, the UN Security Council adopted Resolution 2216, which has determined UN actions in Yemen today. It’s seen to be gender blind. Is it? RJ: One of the main shortcomings of Resolution 2216 is that it didn’t explicitly call for inclusion of women. You need to go out of your way to find an interpretation supporting women’s participation. The Resolution limited women’s participation to a dialogue process, not peace negotiations. However, it referred to the National Dialogue outcomes, which include a quota for women (30 per cent), youth (20 per cent), and Southerners (50 per cent). The Resolution also recalled another Yemen-related resolution that mentions the importance of respecting Resolution 2122 (2013), which is related to women, peace, and security, and mandates the UN Special Envoy to consult with women’s groups regularly. At the recent peace consultations in Geneva, only one of 24 delegates was a woman. Prior to that, Martin Griffiths, the new UN special envoy to Yemen, organized a consultative meeting in London on resuming the political process in Yemen. There were 22 Yemeni leading figures, with only three women. After the London meeting, the Women’s Solidarity Network, with which I work, issued a reactive statement, condemning the failure of the UN Envoy Office to commit to a fair representation of women. We reminded the UN of our demand for no less than 30 per cent participation of women, as per the National Dialogue outcomes document, which is considered a guide to the political process under Resolution 2216. It is crucial that the UN commit to taking women’s political participation seriously. We consider the UN’s failure in supporting a fair representation of women a failure to its own commitments, principles, and resolutions, and a continuation of the dominant patriarchal system. After much lobbying, Mr. Griffiths introduced a women’s technical advisory group that he invited to the Geneva consultations. But still, to us, this is a continuation of the sidelining of women and a failure to support their participation at the peace negotiation table. SM: You have mentioned in previous statements that international nongovernmental organizations (INGOs) working in Yemen tend to portray Yemeni women as passive victims. What roles have women played since their strong participation in the Arab Spring, and particularly in peacebuilding? RJ: The uprising was led by women. Hooria Mashhour, my mother, was appointed a spokesperson of the Revolution Council of Peaceful Forces. The peacebuilding diplomacy efforts operate on three tracks. Track I is the formal peace negotiation process facilitated by the UN. Track II refers to parallel consultations with wider groups. Track III consists of community-level initiatives to support community peacebuilding and local conflict resolution. Yemeni women are leading in Track III. For example, an association called The Mothers of Abductees Association, which began in Houthi-held Sana’a [Yemen’s capital city], has proven to be a lifeline to families of forcibly disappeared persons and arbitrarily detained persons, who are trying to trace their whereabouts. Many members of the Women’s Solidarity Network are active in peacebuilding at the community level. We have women working on resolving water and land armed disputes, women working on reopening schools, women negotiating to open humanitarian corridors, etc. For Track II, UN Women supported the establishment of the Yemeni Women’s Pact for Peace and Security (Tawafaq), which advocates for meaningful participation and leadership by political and social women’s groups in Yemen’s peace process. Tawafaq also aims to enhance gender equality perspectives in peacebuilding. Track I has been disappointing. I mentioned the low representation of women at the London meeting and Geneva consultations. Yemeni women play multiple crucial roles, yet their efforts are sidelined. To help counter this, I am lobbying for an independent women’s delegation to have a seat at the table in the peace negotiations. I have been told that international NGOs and the UN do not want to upset the Yemeni negotiating parties by doing this, and that Yemeni women are not ready or qualified. These experiences have made me realize that the international community can be disconnected to the ground realities of Yemen, and some personnel within UN and INGOs continue to have strong patriarchal mentalities, which are unhelpful to those of us in civil society that are advocating to bolster women’s representation and voice. SM: What prospects do you see for Yemeni women’s inclusion and meaningful participation in the peace process? RJ: We are planning to continue our lobbying and advocacy, targeting the UN special envoy to Yemen to support the inclusion of at least 30 per cent of women in the peace processes in all tracks and on all committees stemming from the negotiation process. We are also targeting our lobbying efforts of national counterparts. For example, we wrote a letter to President Hadi, signed by 300 individuals, calling for women’s participation. We are working on forming an independent women’s delegation that will be selected through a democratic process and then we will campaign for their inclusion. SM: What do you mean when you refer to “localizing the peace process”? RJ: For me, the term simply means a bottom-up approach. We need to listen to people at the community level to understand the local dynamics and to recognize who could be effective mediators. I like to consult with different women’s groups and the missing voices in general. But due to limited resources, I focus on women’s groups. Yemeni women are already contributing to the peace process. My role is simply to help them strategize and bring them resources, technical and financial. Also, I help to make their work more visible to the UN and international community. SM: On a more personal note, your mother, Hooria Mashhour, was the first government official to quit Saleh’s cabinet and she was the Human Rights Minister in Yemen from 2012-2014. Tell us about her. RJ: My mother has been a lifelong advocate for women rights. In 2011, she was appointed spokesperson of the Revolution Council of Peaceful Forces. In 2012, she became the Human Rights Minister; one of the first things she did was to create a transparency department in the Ministry to tackle corruption, which was deep and widespread. She worked to address violations of human rights and dignity. She led efforts to write the first national strategy for human rights. Another key focus was gender mainstreaming. She led a campaign to introduce more women into the police. She also worked to help end child marriage in Yemen. My mother is a very strong woman, but this war in Yemen has impacted her tremendously. After receiving threats to her safety in Yemen, she had to flee the country and sought political asylum in Germany and that’s where she lives now. Once she was legally permitted to travel in Europe, she started speaking at the Human Rights Council about the situation in Yemen, and currently she is an advisor with the International Center for Transitional Justice.